Sep 28, 2015 . . .
Silvia, a 27-year-old American-Norwegian dual citizen, has been living and travelling around the world for the past five years, blogging about her experiences. She is currently in Trondheim, Norway, where she has been living since July. Over the last five years, Silvia has lived in seven countries and visited over 70 nations on five continents. She has traveled solo through Iran and the Caucasus, and backpacked around the Middle East, “My travels tend to focus on less popular tourist destinations such as Iran and the “stans” of Central Asia, where I’ve aimed to challenge misconceptions we have about countries that often suffer harsh representations in Western media,” Silvia says of her travels. Earlier this year, she set out to Iran on her own. “I have never had people express so many opinions about my travels as when I decided to backpack through Iran solo as a woman for two weeks,” she wrote on her blog. “Everyone seemed to have something to say about it, with responses ranging from ‘that is amazing, I would totally join you if I didn’t have a US passport’ to ‘You’re going there alone? What sort of death wish do you have?’, and the blunt words of my extremely well-traveled great uncle, ‘Iran is not a nice place, go to Greece instead’." 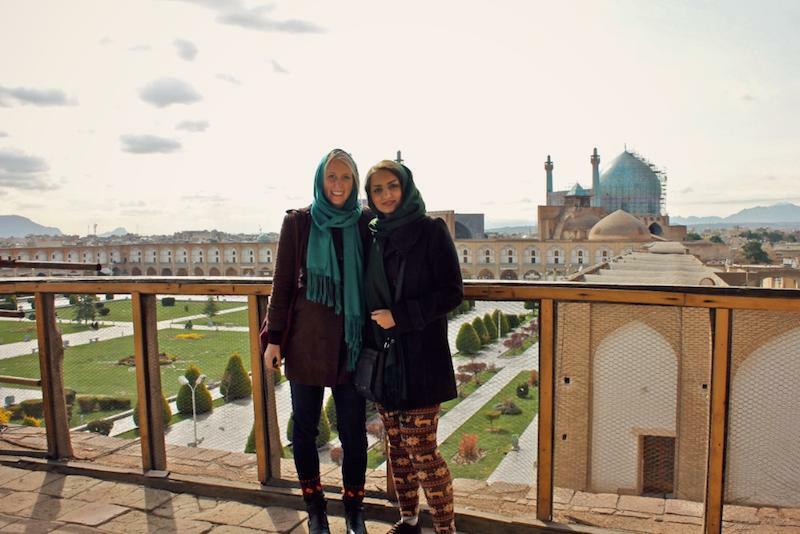 I spoke to Silvia about her two weeks in Iran. Can you tell us more about your background? Where did you grow up? I’m 27 years old and grew up in the United States, but my mother is Norwegian and now I’ve just moved to Norway. I write a travel blog called Heart My Backpack, where I write about my adventures in Norway and around the world. How do you choose your travel destination? There are many ways I choose travel destinations, but I guess I’m particularly attracted to places I haven’t heard much about before. I want the chance to learn about them. On your blog you write that you aim to “challenge misconceptions” about “countries that often suffer harsh representations in Western media.” Can you say a bit more about this? From my travel experiences, I’ve found that places with “bad” tourist reputations often end up being the nicest, with the most welcoming people. I think it’s important for people to actually visit these countries and share their true experiences there. For example, before I went to Central Asia, I wasn’t sure if I should visit Tajikistan or not because I had read that it was unsafe, but I ended up going there and it was one of the best experiences I’ve had anywhere in the world! I couldn’t believe how warm and friendly everyone was. I was eager to write about it so that more people can be inspired to visit. When did you go to Iran? As a woman, were you scared to go there? I visited Iran in March 2014. A lot of people told me I should not go there alone as an American female, but I had read several blog posts from people who had visited and loved it, so I wasn’t too worried. How did you get the visa? Was it difficult? I’m lucky enough to have both US and Norwegian citizenship, and Norwegians are able to receive visas on arrival at the airport in Tehran. I was a little worried I would be turned away because I was traveling alone, but after just 10 minutes, the immigration officials handed me my visa to Iran — I couldn’t believe how easy it was! Finally being in Iran felt very surreal, because it was a place I had dreamed of visiting for so long, and somewhere I wasn’t sure I would be able to go. I must admit I did think that it might feel dangerous, but once I was actually in Iran I felt very comfortable. My visa only gave me two weeks in Iran, so I only visited Tehran, Isfahan, and Marivan. I travelled by bus between cities and spent my first few days with an Iranian girl called Mina who I met through Couchsurfing. She had some time off during New Year so came with me to Isfahan and Marivan where she had friends. I really loved watching the scenery from the bus window — it's amazing how varied the landscape is in Iran, and how breathtaking. When we were in Marivan, Mina's friends drove us through the mountains in Kurdistan, which were incredible and ended up being one of my favorite trips of all time. The villages were so new to me and my hosts had excellent taste in car music! When I left Tehran, I took a bus to Tabriz and then onto Armenia. I was travelling alone then so the journey felt much longer but everyone on the bus was very kind to me. I guess I stood out a lot with my blonde hair so when we stopped everyone would show me where the toilet was or where I could buy snacks. The rest stops were very crowded and hectic so it was great getting some help. I really wish I had had a chance to see more of Iran— there are so many wonderful places that I missed. How would you describe Iran? Iran is definitely a special place. I think a lot of Americans imagine it to be just like Arab countries, but it’s so different. I love that so many women wear brightly-colored headscarves, the architecture is breathtaking, and there is so much energy and life on the streets. I don’t think there is anywhere in the world where people are more welcoming than Iranians. What else did you like? Was there anything you hated? I found Iran to be such a beautiful country, with such a deep sense of history and culture. Of course as a visitor, I particularly loved the famous Iranian hospitality. I’m not sure there’s anything I hate about the country, but I do find it sad that my friends there sometimes struggle for the freedom to express themselves. How easy was it to communicate? Before going to Iran, I learned how to count to 10 in Persian. So at first, that was all I could say to people: 1, 2, 3, 4, 5, 6, 7, 8, 9, 10! But of course a lot of people also spoke very good English. I stayed with one Iranian girl for most of my time there and we are still very close friends and talk to each other all the time. How did you dress when you were there? I just wore jeans or a long skirt with a long jacket and a headscarf. It was a little difficult for me to keep my headscarf from falling down, but otherwise I was very comfortable. Did anything surprise you in Iran? I was surprised by how beautiful Iran’s landscape is. I hadn’t realized you can see mountains from Tehran, so when I looked up during my first day there I was very surprised. 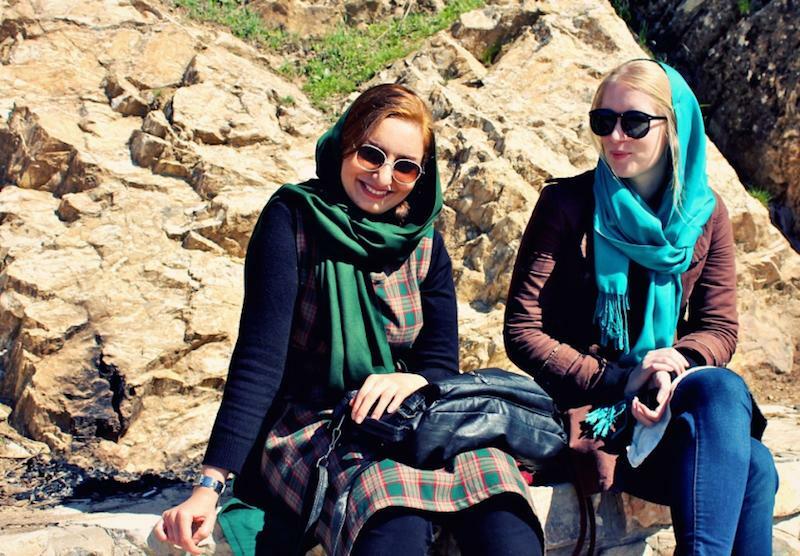 How easy do you think it is for women traveling on their own to travel in Iran? Is it safe? I think solo female travelers need to be careful in Iran, but they certainly can travel safely there. A Polish girl I’m friends with recently visited alone and she also had a wonderful time. You just have to make sure to be careful, as you should anywhere. Did you have any problems during your visit to Iran? I was lucky enough to have no problems at all while in Iran. Did you like Iranian food? I love Iranian food. I think I became so much fatter in Iran! I especially loved doogh [Iranian traditional yogurt drink]. Mmm, I would happily eat Iranian food everyday if I could. I hope I can return to Iran many times in my life. My sister is actually dating an Iranian man who is studying in the US now, so maybe the next time I return to Iran it will be for a wedding? Who knows.